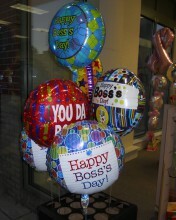 Six mylar Boss's Day balloons all arranged in one bouquet. Add an oversized mylar balloon for only $15. Click the button below to add the Boss's Day Balloon Bouquet to your wish list.